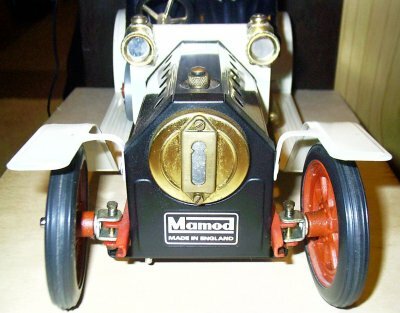 The Mamod SA1 is a nice example of a road vehicle and makes a change from the usual traction engines and rollers. The version in the photograph was a slightly updated model introduced in the mid 1970s to comply with new safety rules, with a solid fuel burner and visible water level. 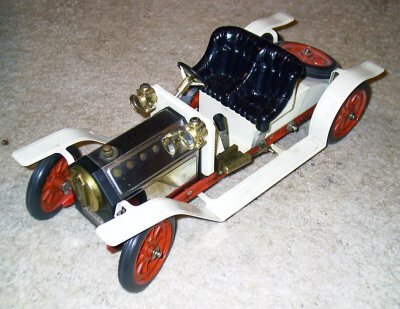 The SA1 is a little untypical in the field of toy steam engines in that it has several plastic components. The seat cover, tyres, steering wheel rim and some bearings are plastic as well as the usual knobs on the reversing lever and the burner handle. The water level window was originally plastic but I have replaced that with a heat resistant glass one. The pair of headlights, which appear at first sight to be plastic, are in fact cast metal. The engine is a single cylinder single acting one incorporating a reversing lever. The cylinder - 5/16" bore x 3/4" stroke - is mounted at floor level on the near side driving a crank shaft passing under the seat with a flywheel on the off side. It drives one of the rear wheels via a two stage belt reduction drive also on the off side. The boiler - approx 1.75" diam x 3.25" long - is totally enclosed by a chromed steal bonnet with the safety valve protruding from the top and the solid fuel tablet burner slung underneath. The front wheels steer on the Ackerman principal and are linked to the steering wheel, which can be controlled while moving using the special rod supplied. The bodywork, mud guards and running boards are painted white while the chassis and wheels are red. Most of the plastic parts are black, as is the front of the boiler housing. This particular model is a good runner and is one of my personal favourites in my collection.